Cobalt City is home to heroes and villains. Originally born as a game setting envisioned by author Nathan Crowder, the universe has since expanded to include several anthologies as well as novels by an assortment of authors. Together, the Cobalt City creators work to craft a rich, believable, exciting world of stories. Amanda’s debut novel, Blights and Desires, a Cobalt City Story from DefCon One Publishing is due to hit bookshelves in 2018. The prologue is currently available as a free download HERE. 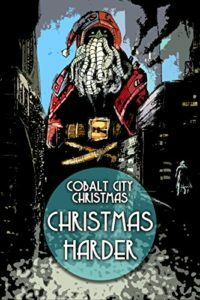 Meet the protagonist, and a host of other Cobalt City personalities in Cobalt City Christmas: Christmas Harder! Available on Kindle.